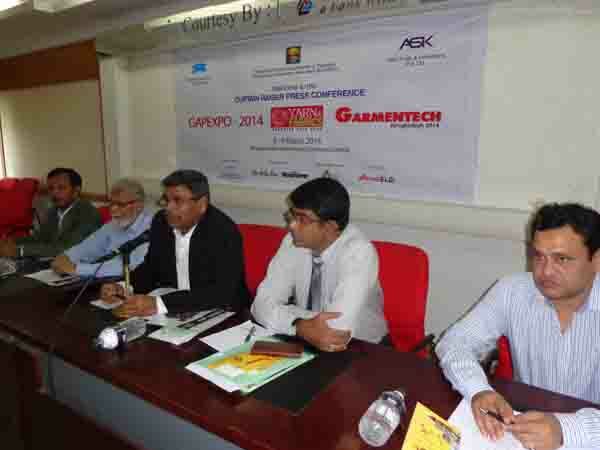 13th Edition of Garmentech Bangladesh-2014, 5th Edition of International Yarn & Fabric Sourcing Fair and 5th Edition of GAP expo-2014 press conference has held on Monday 03 February 2014 at VIP Lounge, Press-club, Dhaka, Bangladesh. 3 International Sourcing Trade Shows under one roof for the RMG industry with participation from 30 countries between March 06-09 in Dhaka. 13th Edition of Garmentech Bangladesh-2014 to showcase latest technology, 5th Edition of International Yarn & Fabric Sourcing Fair to showcase latest collections of Fabrics and 5th Edition of GAP expo-2014 to showcase Garment Accessories and Packaging. Dhaka: 3 International Tradeshows with participation from 30 countries to showcase latest Garment Manufacturing technology, Yarn & Fabrics and Garment Accessories & Packaging. Zakaria Trade & Fair International, ASK Trade & Exhibitions PVT Ltd and Bangladesh Garment Accessories & Packing Manufacturers & Exporters Association are organizing the exhibitions under one roof. Garmentech Bangladesh-2014 to showcase latest global technology related to the Garment making closer to the door steps of the RMG makers in the country. Latest In technology related to improving productivity, quality, compliance and value addition- the key concerns of the industry in the country will be showcased by the global leaders in technology and machinery. As Bangladesh established itself as leading suppliers of RMG to the world, the expectations of safety and compliance is growing. RMG makers are moving up into the value chain by producing value-added Garments. Previous:Intertek Bangladesh inaugurates its Narayanganj Office on 19th January 2014 at Signboard area of the city. Next: The 9th IPF 2014 press conference has held on Tuesday, 18 February 2014 at BPGMEA office and speech delivered by Mr. Md. Jashim Uddin, President, BPGMEA.